An autocomplete box appears if needed. Right click to see these options. Click to go directly to a function. The Code Window is used the edit the code in your program. 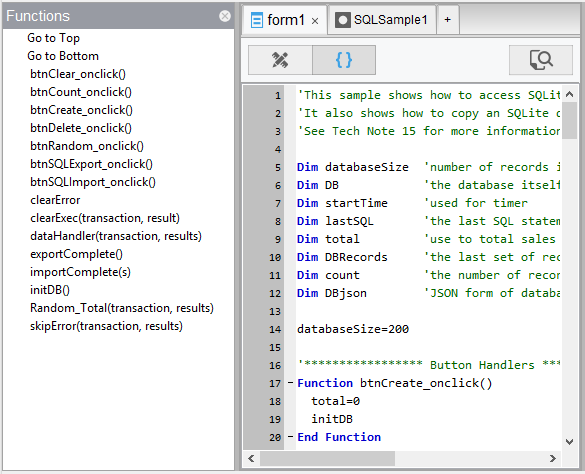 You can put all your code in a single block, or have a separate code block for each form as well as a global section. At runtime, they are treated as a single block, so be careful not to redefine functions or variables. In BASIC, statements can be made longer than one line by using a space and a “_” character at the end of a line. Syntax checking is done as each BASIC line is completed. If there is a syntax error, the line gets a red underline. If you hover over it, you can see the full error message. Cut, Paste, Delete and other similar functions can be used from the Menu, the Toolbar or the keyboard. Line numbers may be up to 99999. Format Code cleans up the formatting of BASIC code, normalizing all the indents. The dropdown bar at the top of the screen can be used to go directly to a Sub, Function or line number. Code Folding makes it easier to look at just the code you are interested in. Click on the minus sign to the left of a code block to collapse it. 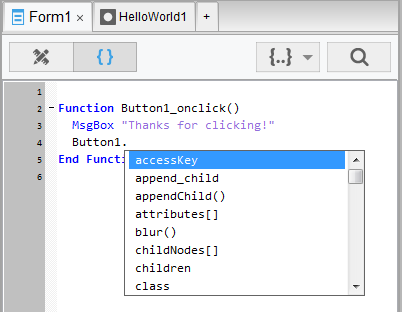 To go directly to a function in your program, select the name of the function elsewhere in your code, right click and select "Go to function definition." If you have gone directly to a function, the 'Return' option will take you back. 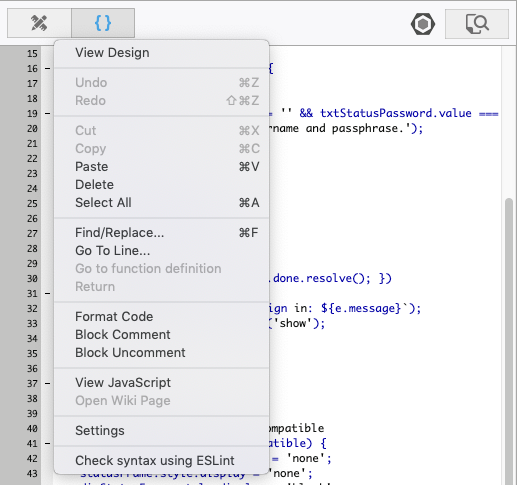 To insert code from an external file, drag and drop the file from the Finder into the Code Window. The code will be inserted into your app at the current position, just as if you had typed it in. You can insert code from .txt, .cod, .bas or .js files. To bring up the Wiki page for a keyword, select the word, right click and select "Open Wiki Page". Where possible, hints will appear for objects when you enter the period. Where possible, tips will appear for functions when you enter the open parenthesis. (Note: does not currently work on Mac). This page was last edited on 16 November 2018, at 00:17.